Last Friday I had the privilege of participating in an early launch of the new fragrance brand, Thierry Blondeau. The event was especially pleasurable because Thierry, who is both the perfumer and the brand owner, is also a friend. Turns out that in addition to writing his perfume blog, Olfactorum, Thierry has been nurturing a passion for perfume creation, which as of this month could no longer be kept under wraps. 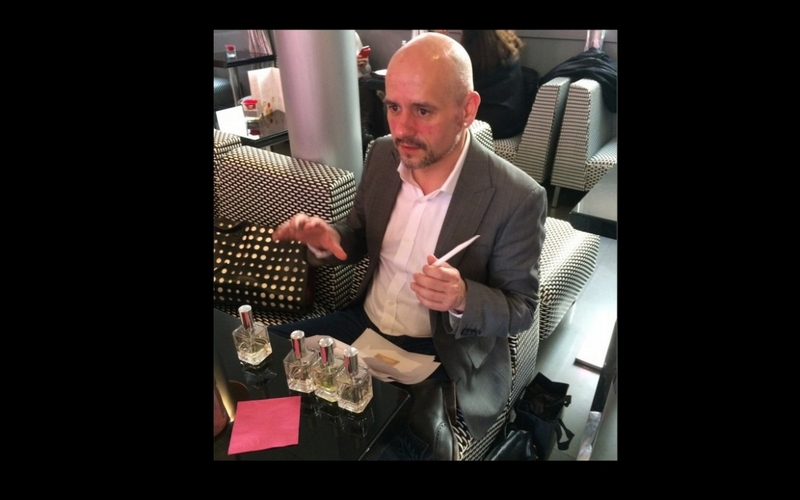 “I simply can’t prevent myself from creating fragrances,” he told the small group of journalists/friends gathered in the upstairs tearoom at the Fauchon Madeleine in Paris. And like so many people in the fragrance industry, we all knew what he was talking about. Passion ! Each of Thierry’s four fragrances speaks clearly and separately. Together they cover a broad range — from ‘Alea Jacta Est’, a floral with a bite that made me think of the American 60s comedy, The Little Shop of Horrors, to ‘Cuir Extreme’, a smoking leather fragrance that made me think of a burning pirate ship. In between, there is ‘Jessy’s Rose’, a simple and easy to wear rose, and my favorite of the four, ‘Narcisse Émoi’, a citrusy leather floral fragrance with a powdery note. Though definitely edgy, ‘Narcisse Émoi’ is also very wearable. The name, ‘Narcisse Émoi’ carries a double meaning in French because ‘Émoi’ means ‘emotion’ (think stirred, or agitated emotion), but when the full name of the fragrance is spoken, it sounds like, ‘Narcisse et Moi’ (Narcisse and Me). And then — as is often the case at informal dinner parties — we were interrupted, the conversation shifted to other subjects for the rest of the evening, and we did not get to the discuss further development of the fragrance — the dry down, the sillage, the signature. Upon reflection, I feel that these circumstances offer an excellent place for me to stop telling ‘Narcisse Émoi’’s story. At least, for now. It’s very early in the day, and somewhere in a field of Daffodils ‘Narcisse Émoi’ is young and fresh. She’s waiting to be discovered. Ready to share her mysteries. The four Thierry Blondeau fragrances are currently available in France at Jovoy in Paris, and at La Maison de Parfums in Rouen. I’ll see if I can bring some with me when I come to the US in July. Think you’ll love it. ‘Narcisse Émoi’…Let’s meet upstairs tearoom at the Fauchon Madeleine and you bring me a sample. See ya then! Any time, Farley. And bring Rojé.